There was a time during the 80s in Indian filmdom when every star worth his bag of salt launched his kin amid much fanfare with a standard headline - He had been trained in karate, swimming and horse riding by experts in the respective fields for the past three years (and has readided himself to ride the coat tails of my legacy, went without saying). Exactly how those skills added up tp even an iota of histrionic ability, none questioned.. The glaring implication was that acting and other serious stuff are why character and other supporting actors are paid for (even the term supporting actor reeks of irony, in it, they seem to prop, support and essentially drag along the mediocre star to passable levels, a la, mountain sherpas), while stars are supposed to look good and train and flex everything but their acting muscles. All this emphasis on those three face-saving skills, before the brawn bug hit the shores of the Indian peninsula and every male actor capable enough of producing sufficient testosterone started ripping their sleeved shirts shirts in various states of undress, tilting the scales even further in favor of physicality at the expense of even a modicum of theatricality. This is not to say that physicality doesn't have a place in movies, or more, physicality can never outweigh the dramatic worth of an actor. There are three prime examples in the history of modern world cinema who rose to great fame (and stayed there forever) purely on their physical dexterity and ability to engage the audience at a visceral level - Buster Keaton, Charlie Chaplin and Jackie Chan (a notable mention would be Harold Lloyd from the silent era in the 20s. Chaplin, however, has a leg up over the other two venturing into the dramatic side, quite often, even in his slapstick routines). Broadly speaking, people watched their movies not for their stories, characters or other dramactic highpoints, but purely for their physicality. The grace with which they glided through the motions was worthy of serious dance forms, underlining the choreography part of the term "stunt choreography". They never relied on the standard tricks of the stunt trade, reaction shots of stuntmen, the editor's ability to amp up the adrenaline, or (the current bane of action movie) impressive props/gadgets/effects . In fact, all the three performers rarely relied on the post production work and almost all their action happened right in front of the stationary camera mounted on a tripod, enthralling the audience with the two most important aspects that actors (nah, acrobats) as these pegged their performances on - timing and dare-devilry. When a 20 foot wooden wall comes crashing down on its elevation and the actor (Keaton) doesn't move an inch from his place and all he was relying on was a little hole cut on the top of wall to EXACTLY match his spot (https://www.youtube.com/watch?v=FN2SKWSOdGM), the thrill of the stunt is bound to ripple, rise and crest through the audience, witnessing not just the audacity of the stunt but the sheer preciseness of it. The reaction and applause to such daredevilry is just as reflexive and instinctive. And joining such great pantheon of illustrious physical performers is Tom Cruise, who can now dare go toe to toe against such artists, living or dead, and come up all trumps. 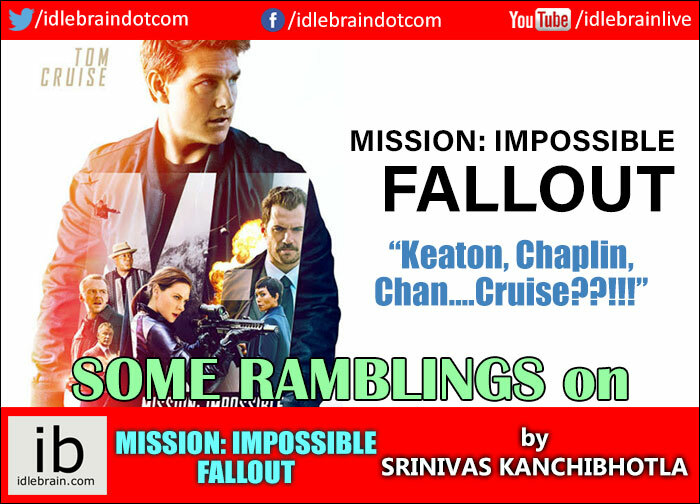 'Fallout' is an exciting, electrifying, edge of the seat exercise of near impossible physical maneuvers wrapped in a movie format. Though Cruise has long been relying on the M:I series as a reliable crutch to return to the action genre, once every few movies of other stripes, executing thrilling stunts in stunning set pieces, never has been the commitment to the physical craft of the performance this thorough and engaging as in 'Fallout', where the emphasis was all on the 'act' itself than on the action. The dedication and delivery of the stunt sequences right from the design part down to the execution reminds of the Cirque De Soleil aerial routines, or the even tougher famed ballet performances that rely on years and years of physical conditioning to have the body bend and contort to will. When Cruise, at this (st)age, still indulges in the most favorite part of movie making, bolting like the wind in long continuous takes, when he lunges across buildings, even with all the safety harnesses in place, rams his foot against the wall and breaks his ankle in the process, when the camera doesn't cut away from his face as he expertly and quite dangerously weaves in and out of lanes on his bike, while on busy roads, or expertly careens past tall mountains piloting a helicopter on his own in steep canyons, the goal here is clearly to not aim for any cerebral stimulation, but hit those part of the senses that cause the jaw to drop, pupils to dilate, heart to pump and the mind to scream in excitement. The gay abandon with which he throws himself at these stunts deserves this type of setup, where plot, dialogue and all function to put him in different places, in different suits on different modes of mobility, and simply step away and let him take over from there on. The script clearly understands its role and doesn't try to burden the proceedings with any unnecessary gravitas or respectability (which the last Bond venture 'Spectre' was accused of), and instead like the scene changes on stage plays, serves to merely change the backdrop and move aside into the wings, making 'Fallout' an amazing circus act than a movie. The good thing about it is, even the makers acknowledge its underlying premise/ruse, and when expectations and delivery are on the same eyeline level, the result is endlessly satisfying. 'Fallout' marks Cruise's first and complete embracing of his vast potential as true physical actor (though, like Chaplin, his dramatic oeuvre is more than creditable), and the future appears awfully bright, both for him and the audience, with his renewed focus on this dark side of the moon.